These numbers showcased MTVW’s best-ever H1 performance and continued the trading moment witnessed within June’s record full-year results. Revenue gained 16%, operating profit advanced 21% while net asset value (NAV) per share climbed 9%. In addition, the first-half dividend was doubled to 200p per share, although MTVW made clear this increase was a temporary ‘front-loading’ of the annual payment due to forthcoming taxation changes. It was significant to see MTVW’s gross margin improve further to 66% — equal to the highest level achieved back in 2008. Clearly the firm is currently able to enjoy good sales prices on the historical cost of its properties. At £50m, net debt has never been lower since 2007 and compares very favourably to total assets of £363m. There has never been any subsequent word on finding Duncan Sinclair’s successor. However, today’s results were accompanied by news that a younger member of the Sinclair family is to join the board. Dr Andrew Williams, a grandson of company co-founder Frank Sinclair, will replace Alistair Sinclair, a son of Frank Sinclair, as a non-exec. Dr Williams owns 1.4% of the company and is a member of the family’s 53%-stake concert party. As such, I don’t think it likely the new director will disrupt the board too much (I know there are significant family shareholders outside of the concert party that might behave differently). MTVW’s interim figures from last year revealed the group’s trading properties had a market value of £666m (with tenants in situ) versus a book value of £318m. The group’s then chairman had suggested at the 2014 AGM that a revaluation would take place every year. However, comments at the last AGM have since scotched such plans on the basis of cost and benefits. These results showed trading investments of £331m which, if sold at the the average margin enjoyed during the last ten years, would be worth about £860m. Taxing the gain at 20% and then adding on other investments of £28m and subtracting net debt of £50m, I arrive at a possible NAV of £732m or £188 a share. That compares to £180 a share I estimated in June and the £77 per share NAV reported by MTVW today on a historical-cost basis. With the share price at £113, clearly there is still some upside possibilities here. But as before, the big unknown remains how long it will take MTVW to sell its existing properties to realise my potential £188 per share NAV. Hi eezy — I’m not VegPatch, but MTVW’s gross margins have bobbed around over time, a high of 66% being reported in 2008 and a low of 48% in 2009. The margin is dictated by the original cost of the stock and market conditions for selling. One significant unknown is exactly which properties will come up for sale in any given year — nobody knows for sure because they are only sold when the tenant leaves or (more often) dies. So that particular factor influences margins to some extent — properties sold can have been held for decades or in theory just days. Future sales ought to be conducted within the (albeit wide) historical range of margins as house prices ought to rise over time and the holding period between purchase and sale ought to even out as well. I suppose you could go back ten years and ask the same won’t-margins-be-lower-in-the-future question — only to discover margins actually held up well. FWIW, over the past ten years, MTVW has sold the average property for c2.6x its original cost and that I think is a good as any guide as to what the next ten years may hold. We can now deduce the markup on the properties sold during the six months. 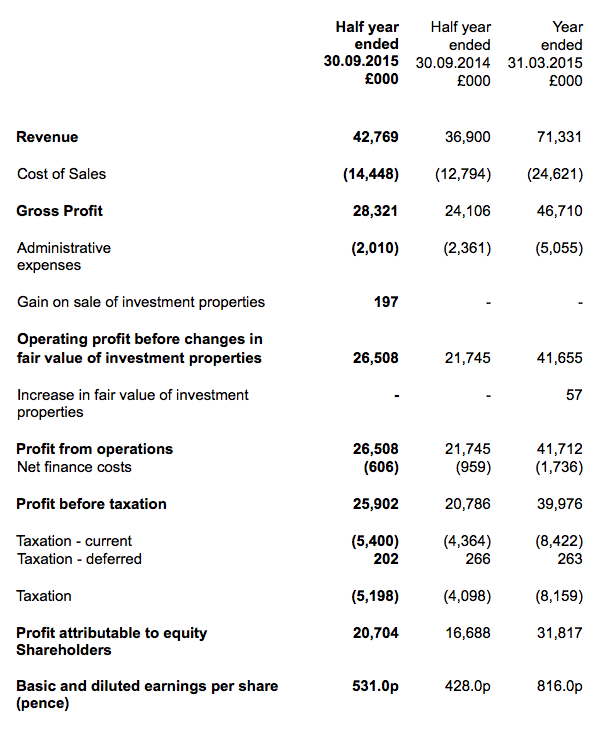 £33,665k/ £11,535k = 192% profit. Not bad. Better than the 186% scored during the last full year, though below the record 245% recorded during 2008. Also of note is the disclosure that the market valuation of the properties sold — based on the Allsop valuation undertaken last September — was £24,450k. The real market value was £33,665k or 37.7% greater. The Allsop valuation indicated that MTVW’s then property estate was worth £666m with the tenants in situ. Going on this (albeit limited) data, the sites seem to be worth 37.7% more with the tenants gone. 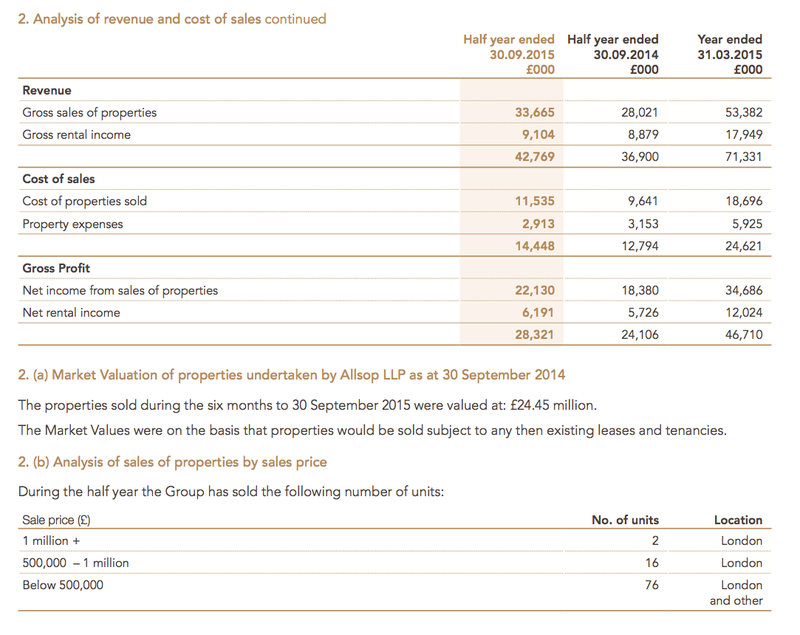 So taking that £666m Allsop valuation figure, multiplying by 1.377 gives £917m. The difference between the then cost of the properties at Sept 2014 (£317m) and that potential real market value (£917m) is £600m, which taxed at 20% is £120m. So £917m less £120m tax less current £50m net debt plus £28m other investments gives a £776m asset value, which equals… £199/share. These sums may not be truly accurate, because I have taken the property base as at Sept 2014, and other figures from Sept 2015, but the final result ought to be roughly right. “The Fund welcomes and supports Grainger’s actions to streamline the business and cut costs; however we remain concerned both with the pace and scope of cost cutting. We note that last year Grainger, with a £900 million market capitalisation, incurred administrative costs of £42 million. Mountview Estates, a company in the same sector with a market capitalisation of £450 million, incurred administrative costs of £5 million. Neither is the Fund convinced of the merits of investing £850 million into the private rental sector rather than reducing debt, particularly at the time of global financial uncertainty for asset classes. Crystal is an activist fund and does not seem entirely happy with progress at Grainger. Interesting that Crystal wants Grainger to spin-off its regulated properties — such a transaction might provide a good value benchmark for assessing MTVW. I think MTVW will have to pay the extra SDLT. “Q24: Will a company be subject to the higher rates of SDLT? The financial effect of the extra SDLT won’t be felt in MTVW’s profits until the properties are sold in the years ahead. In the meantime, perhaps there will be less competition buying regulated tenancies and so prices may become more favourable for buyers. “Q26: I have a share in a limited company which owns a property for rental to tenants. I am purchasing another property which I will own direct. I do not own any other residential property. Will I have to pay the higher rates apply? It is not 100% clear, but “cost includes legal fees and commission charges” suggests that the books carry the trading properties with SDLT included in their book-value cost (i.e SDLT is not charged to the P&L during the year of purchase). Net realisable value of the trading properties is based on vacant possession, which should always be higher than cost. So as I see it, the existing NAV will not be affected by the higher SDLT and the future NAV will simply have future purchased properties valued at cost with the higher SDLT included. …but in terms of MTVW’s accounting profits, will only have an effect in the P&L when the property is sold in the years ahead (the effect will be a lower gross margin to reflect the higher original SDLT cost). Agreed, I don’t see the higher SDLT as having a more long-term effect. A lot of other events will happen between the time MTVW starts paying the higher SDLT and when it starts selling those same properties.